Regiment/Catrawd: 'A' Company, 26th Battalion Royal Fusiliers. Service Rank and Number / Rheng gwasanaeth a rhif: Private No. 19574. Military Cemetery/Memorial / Fynwent milwrol: Berks Cemetery Extension. Ref No Grave or Memorial / Rhif cyfeirnod bedd: Plot: 1. Row: D. Grave: 19. Killed in action on Wednesday 16 August 1916, aged 21 years. Donald William Capper was born in Bakersfield, Califonia, United States of America during 1895. (no further details are known of why or when the family resided in the USA). The family are, however, back in the United Kingdom by 1901. The 1901 Census tells us that the family lived at ‘Ashgrove’, 18 Grosvenor Road, Wrexham, Denbighshire. The head of the family was William Newton Capper aged 39, who was an Auctioneer and Valuer. His wife Clara Fletcher Capper aged 38, and their 5 (five) children – Eric Hurst Capper aged 11, Doris Mary Capper aged 9, Enid Newton Capper aged 8 and Donald William Capper aged 6 years. Also living at the family home was Hannah Roberts aged 24 and Alice Roberts aged 23, who were employed there as General Servants. The 1911 Census tells us that the family were now living at ‘Homedean’, Wrexham. The head of the family William Newton Capper, aged 49 was an Auctioneer and Land Agent. His wife Clara Fletcher Capper aged 48 and four of their five children who were still living in the family home, namely, Eric Hurst Capper aged 21, a Bank Clerk. Doris Mary Capper aged 19, Enid Newton Capper aged 18 and Donald William Capper aged 16, who attended Grove Park School, Wrexham. A Sarah Corbett aged 22 was employed as a Domestic Servant. In January 1913 at the age of 18 years Donald obtained employment as an apprentice at the National Provincial Bank at their Denbigh Branch. He later transferred to the Bank’s Rhyl Branch. During September 1915 Donald enlisted as a soldier with 26th (Bankers) Battalion, Royal Fusiliers, a City of London Regiment. This Battalion was raised in London by the Lord Mayor for volunteers, who were mainly Bank Clerks and Accountants. Donald served with the Battalion in France and Belgium and was killed in action on Wednesday 16 August 1916. 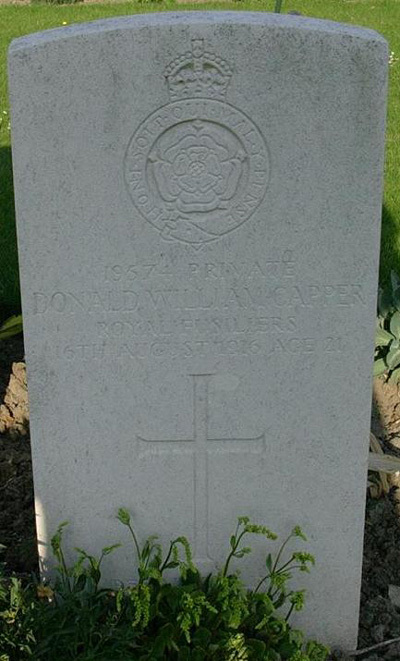 Headstone of Private 19574 Donald William Capper. Berks Military Cemetery Extension, Hainaut, Belgium. 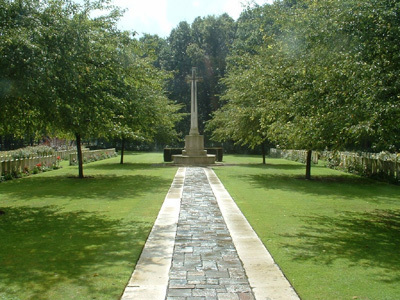 Berks Military Cemetery Extension, Hainaut, Belgium. On Monday 27 November 1916 and Friday 26 January 1917 payments of £1.5s.6d and £3.4s.10d were made by the War Office to William Newton Capper, these being monies owed to his son Donald. On 24 September 1919, a further payment, which was recorded as a War Gratuity of £3.0s.0d was also made to him. Following Donald’s death the National Probate Calendar, administered in London, dated 5 May 1917 recorded that he had bequeathed the sum of £278.2s.7d to his father William Newton Capper. Donald William Capper is also remembered on a Memorial Plaque at the Alexandra Hospital, Marine Road, Rhyl, Wrexham War Memorial and on the Minera War Memorial, St Mary’s Parish Church, Minera, Wrexham, Denbighshire. At the present time no evidence can be found that Donald had ever lived in Rhyl, Flintshire and why his name should be on that War Memorial or Roll of Honour plaque.